If you have questions about writing, studying, submitting or publishing poetry or fiction, you can ask them and find answers at Poets & Writers Speakeasy. An active online forum, with archived posts dating to 1999 or earlier, the Speakeasy addresses these and scores of other topics. You must be logged in to participate in the forums and registration is free. Bare feet kiss the luscious green grass. Toes wiggle into the dark depths of the dirt. carrying me on its adventure. who bubbles the language of life. I am the happy outcast disregarding womanly manners. no Easter hats, no lacy gloves. No patent leather Mary Janes. gone are the braids wound upon my head like a crown. by the master painter with his paint brush. 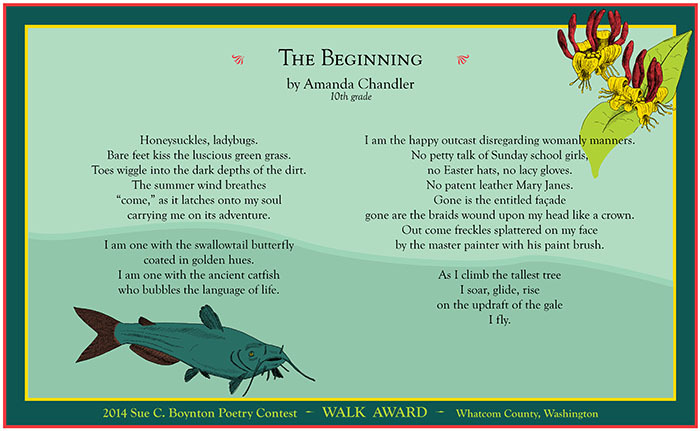 *Copyright 2014 by Amanda Chandler. Broadside designed by Anita K. Boyle, Egress Studio. Illustration by Angela Boyle, Flying Dodo Publications. Leiden is a Dutch university town on the Old Rhine, with a population of about 120,000. Along with windmills and picturesque river scenery, the small city has an impressive display of Wall Poems. Between 1992 and 2005, a private foundation facilitated the installation of 101 poems on the sides of Leiden’s buildings. The poets and poems are eclectic and international; the collection is still on view. An English-language page on The Wall Poems of Leiden website offers a brief introduction as well as access to a visual inventory of the poems with images, translations, descriptive material (not always in English) and links.